In these camping sites you can connect 220V power to your motorhome, empty toilet cassete & waste water tanks, refill clean water tanks (that you can also do for free in almost any petrol station) and you can find in these places often in the weekends parties, music and lot of people. They have often also a shop, bar, restaurant, pool, nearby golf etc. Next to the beach "Playa de Vargas" where you can also practice surfing and windsurfing. Nice camping site with lot of services and activities in beautiful natural area. Regularly they have different events going on there that can be tracked from their Facebook if you add as a friend (in Spanish). Photos: click on the image on the righ + more pictures at their website. How to get there: It's in Agüimes area. Access via road GC-191, leave the highway to Montaña Los Velez and Las Rosas. See the map! GPS: N 27º 53' 31" / O 15º 23' 46"
Explore bit different nature from the ocean side. Beautiful mountains but yet not so high from sea level so the air isn't cold yet. Photo: click on the image + more here. How to get there: Lomo de la Cruz, 27. Agüimes. From the south take the road "Parque de los Cocodrilos en Agüimes" GC-815 and from there turn to left to the direction to Santa Lucia. See the map! GPS: N 27º 53' 51" / O 15º 29' 17"
Equipment and services: natural bath in 1,2km; Electricity to connect to motorhome; Sinks with cold water (can refill tanks); Cold and hot water showers; WC; Laundries; Bar; Restaurant; Children park; Pool; Tennis/padel courts. Fot these camping sites you don't need to have any permission. Basically you can park the motorhome in Canary Islands everywhere where it's allowed to park any other car. There are like anywhere else many places to park for free and many places where you have to pay for the parking (for example from 8am - 21pm you have to pay eg. €1 per hour). There's a law that you are not allowed to park the car in one place for more than 48 hours. After 48 hours you need to move it to the next parking slot or move it for one vehicle length ahead for example. There's another rule when you are parking in a free parking lot. When you go to sleep, you need to close the side awning, pick up chairs/tables/etc, close doors and the main windows. If you leave windows open then sometimes it has happened that police has asked if you are camping here. If you then say yes but I leave tomorrow then everything is fine. But if you close the windows then you can be 100% sure that nobody will ask any questions from you. Most of our customers though keep windows open and just close the awning, doors, etc. when going to sleep unless you camp in Las Palmas close to the centrum. We have had hundreds of happy customers who have had never problems following these simple rules that we have beel always using ourselves, too. Natural beach "Playa de las Mujeres"
Playa las Mujeres means "beach of women" but don't worry it's unisex. It's small and more private sandy beach next to the famous mountain Montaña Arena. You can park very close to the ocean here! Sometimes there are also other motorhomes, too. Photo (click on the image). How to get there: very easily accessible from Maspalomas. It's basically just next to it. See the map! Also see on the map the small off-road you need to take. Activities: Grill. Ball games. Inflatable motorboat trip. Fishing & swimming. Visit Casito Blanco and/or Meloneras by bike. Fishing village "Castillo del Romeral"
Next to the sea and small fishing village (Castillo del Romeral that means in Spanish "castle abounding with rosemary"). Quiet and secure place for camping. Photo (click on the image). How to get there: Leave the main highway GC1 exit 30 to Juan Grande. See the map. Activities: Grill. Ball games. Inflatable motorboat trip. Fishing & swimming. Visit by bicycle Juan Grande or take a walk to small fishing village Castillo del Romeral. Great place to explore the north of the island close to the Las Palmas. You'll see beautiful and rough waves here and at the same time you can safely swim in natural pools that you'll really love. There's also small but beautiful sandy beach and few rocks to sunbathe and climb. Photo (click on the image). How to get there: See the map. Beautiful view over the Las Palmas and Las Canteras beach. Quiet and secure place but still close to Las Canteras beach and Las Palmas centrum - 10 to 20min with bicycle. Photo (click on the image). How to get there: Take the road to Galdar. See the map. There is really huge amount of state-run official camping sites in Gran Canaria where you can camp for free and which are located throughout the island in beautiful places in the nature. These are well kept secret from tourists. They don't advertise them because they don't want masses of tourists to go there with their motorhomes or tents. Tourists are although welcome there and the campsites are for free but you'll need a permission to go there. Getting the permission is quite simple and everybody get it - they just want to keep most of the tourists away from more quiet naturally beautiful campsites. You can let us get the permission (we'll charge small fee €5) or you can do it yourself by emailing to oiac@grancanaria.com or calling to (+34) 928 21 92 29. You need to get permission 3 days before you go although it's sometimes also possible to get it for the same day. Permits can be collected from Las Palmas from "Cabildo de GC" (Edificio Insular 1, Calle Profesor Agustín Millares Carló - see map). At most cases you can just tell that you have the access and tell your name when someone asks and you can camp without printed premit. One of the most beautiful camping sites in Gran Canaria. It's located nexto to mountain lake with same name Presa de las Niñas (dam lake of girls) and it's surrounded with pinewoods. You can take a short walk from there and see below another dam lake La Presa de Chira. Panorama (click on the image in the right), 360 degree view. How to get there (map): best way is to go there from San Bartolomé de Tirajana (see map) that is actually great nice town to visit and there you can get for example from Playa del Inglés and Playa del Inglés is already next to the main east highway between Las Palmas and south (GC-1). Other roads are smaller and more difficult mountain roads. Don't use with motorhome the road from Mogan (see map)! That's too narrow and going too straight up and is not suitable for bigger vechiles like motorhome. Amendments: Water, fireplaces/grill, tables/chairs, bathrooms. Activities: Campfire in burner & grill. Ball games. Inflatable motorboat trip. Fishing & swimming. Mountain bike routes. Walking & hiking routes (Easy 1.7km, Easy 10,5km, Moderate 17.1km wholde day hike, Difficult 16,5km). There are many trails for hiking with bicycle to almost all directions. Also very beautiful walking routes and Roque Nublo is just 2km away. You can see here almost every evening spetacular sunsets and all the picturous mountains around Roque Nublo. Activities: Campfire in burner & grill. Ball games. Bicycle routes. Walking & hiking routes. All camping information will be coming soon to website... On board printed version of the guide. 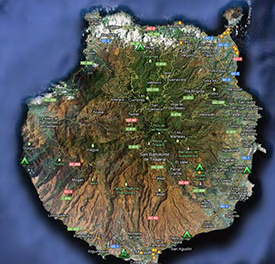 Meanwhile, you can see our Google Map with some more campings and parking areas on it where at most times there's place to park your motorhome..
Our old good Gran Canaria map here and now also adding some places in Tenerife! If you have smartphone, tablet or laptop with you we can provide local SIM card with 1GB data plan and call-SMS time so you can find the campings more easily. Although there's GPS navigator on board, some campings doesn't have address and it's easier with Google Maps. On the map you'll find also all kind of places of interest and parking where there's room to park your motorhome. We have picked places where usually there's not fully parked so you can easily find a place. All hiking, walking and cycling routes are categorised as easy, medium or difficult. They start near the place where you park your motorhome and end in a same place. All routs are in Google map and downloadable for your Android/iPhone, Garmin, Google Earth KML file, in GPS exchange format GPX or as TCX - training center database XML format from Wikiloc. Rent a bicycle, inflatable motorboat and other extras! From just a €4.50 per day you could be exploring all the interesting places around your motorhome by cycling! And of course our motorhomes have also bisycle racks! Inflatable motorboat for 4 people: from €29.35/day. Gran Canaria's reputation is "party island" but actually more than 40% of the island is Unseco biosphere reserve. If you take your route away from touristic resorts and towns Gran Canaria is great for camping with it's great variety nature, climate and habitats. That's what Gran Canaria originally was meaning. Gran Canaria was populated by the Canarii / Guanches (you can learn about their culture at Museo Canario at Las Palmas), who may have arrived as early as 500 BC.